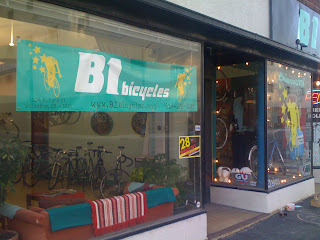 I stopped over at B1 Bicycles to talk to Casey about possible sponsorship of the Bike the C-Bus (hint hint) He recently expanded the store and now has second storefront full of bikes. This month, the Short North Arts District is dedicating Gallery Hop weekend to Rachel. You can support Rachel by participating in our Hope Weekend events. On the evening of May 15, Rachel Widomski was seriously injured by a hit-and-run driver outside of Haiku restaurant. Rachel’s severe spinal cord injuries will leave her paralyzed for life. Please join us in a city-wide fundraising effort to help support Rachel and her family during her long road to recovery. The Pan Ohio Hope Ride is a bicycling tour that enables you to not only take an incredible bicycle journey, but also to tremendously benefit the American Cancer Society Hope Lodges and other vital patient care services. It is a tour both inspiring and life changing. With each passing mile, you will discover the beauty of Ohio’s scenery; experience areas you didn’t know existed; challenge yourself to pedal, talk and laugh; make new and lasting friends; hear inspiring stories of hope and courage; and send a message to all those fighting cancer right now a message that you are doing something to help. The Pan Ohio Hope Ride will take cyclists from Cleveland to Cincinnati in a four-day tour through Ohio’s scenic countryside from August 7-10, 2008. Challenge yourself to hit the road and make the road smoother for those battling cancer. The Pan Ohio Hope Ride is a special fundraising event to benefit Society Hope Lodges and other vital patient services. We have numerous ways to help you raise funds by reaching out to your friends, family and employers. Whatever you can raise will go to help those in need who are fighting cancer right now. Fundraising raffle: We're giving away a new bike! 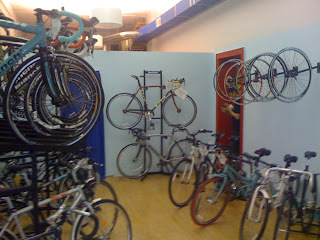 For every $500 you raise, you'll earn one entry into our raffle for a new Cannondale CAAD9 6 from Eddy's Bike Shop! Read more! You can make a difference in the lives of cancer patients. Support the American Cancer Society’s efforts to save lives, help cancer patients, and empower communities. You can touch that support at the Society’s Hope Lodges in Cleveland, Cincinnati, and 24 other cities around the nation. Cancer patients and caregivers who have to travel for treatment find free, supportive lodging during lengthy stays. Some sprinkles of rain - beautiful sunset. 6 people to start - lost one to dinner at his girlfriends.